I see history as fluid. A never ending story, twists and turns dictated by centuries of set in stone religious or political bias. A few hundred years ago science got its foot in the door. Released from religious restraint and political white wash, science is turning historical stone to dust. Gobekli Tepe, discovered in Turkey during the 90s, turns accepted historical timelines on their head. We cling to cradle of civilization Mesopotamia, yet science proves Gobekli Tepe is thousands of years older. Most people haven’t heard of it. Educators rely on unimaginative textbooks, unwilling to introduce irrefutable science because facts are few. Science believes Gobekli Tepe a place for religious gatherings. Circle after perfect circle, with reliefs of animals carved into surrounding pillars. Each pillar the exact same height, many of the animals not thought to be indigenous to the area. By all appearances it was purposely buried. Then there’s Puma Punku. My pulse races pondering this place. 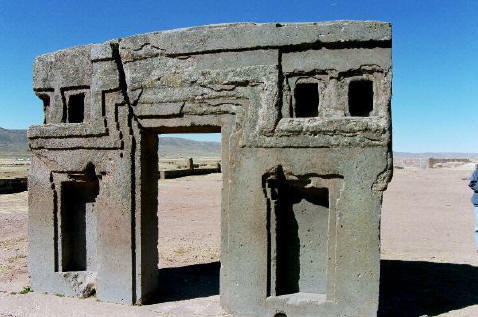 Located in Bolivia no one knows who built it. By some estimates – 17,000 years old. At an elevation of 12,000 feet, granite slabs of stone weighing hundreds of tons were somehow moved from a quarry miles away. If that doesn’t make you smile; ponder the precise stone work and intricate carvings. Science deals in facts of which there are few. Puma Punku makes me smile because it obliterates “set in stone” history with more questions than answers. I smile because we can ask those questions and hopefully expand our shallow textbook minds.